Anger. Fear. Sadness. Dr. Judith Orloff sees people every day who are struggling with these overwhelming emotions. To help us find relief, she has created Emotional Freedom Practices. This two-CD tool kit expands on the insights from her recently released New York Times bestseller Emotional Freedom (Harmony, 2009) , featured in a new public television special. Listeners will discover how to turn away from negativity, react constructively, and seize command of any life situation. What's the key to fi nding liberation from negativity? Dr. Orloff teaches that it's how we choose to respond to external events that determines our experience. Drawing from the fields of biology, psychology, and intuitive medicine, Dr. Orloff offers exercises, self-care techniques, and meditations that help transform fear into courage, disappointment into patience, and anger into compassion. 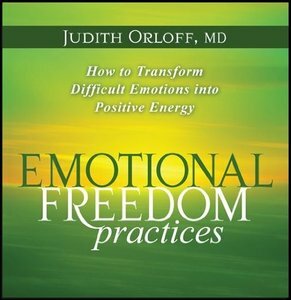 "Achieving emotional freedom gives you access to your own power center during jubilant times and in adversity," teaches Orloff . Emotional Freedom Practices is a program in self-mastery that will help anyone attain a high quality life, handle stress artfully, and find serenity--even in the most overwhelming situations.